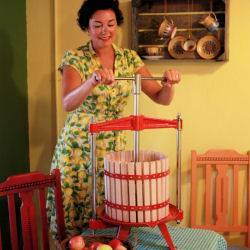 Making cider is really easy using a Fruit Press and a good way to use up a glut of fruit. 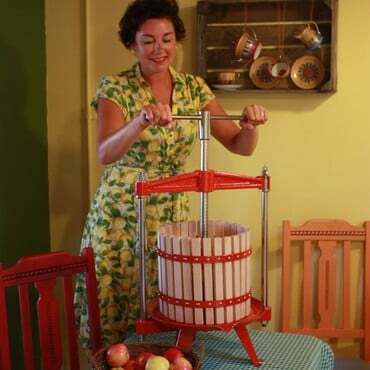 Some “experts” say use only cider apples, others mainly dessert and others mainly cooking but in reality most home cider makers use whatever apples that they have at hand. Make certain they are fully ripe, undamaged and not heavily bruised. Keep in a cool place for 1 or 2 weeks to soften the skins. Wash the apples to remove any insects, soil, etc. before processing. You won’t wash off the natural yeasts required for fermentation. Crushing - This can be done by putting the apples in a strong tub and pounding them with a length of timber but is heavy on the arms. 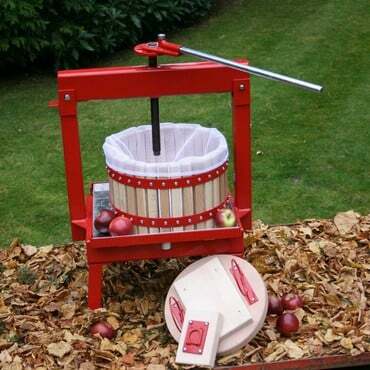 If you are likely to make large amounts of cider, it is much better if you use a fruit crusher. The pulped fruit now needs to be pressed to extract the juice. You can get away with a domestic fruit juicer for small amounts but for larger amounts buying a fruit press is a cost effective and time saving option and a worthwhile long term investment. The pH of the juice should be in the range 3.9 to 4.0 to give the right amount of sharpness. This can be checked using a small soil testing pH meter. To higher the pH add precipitated chalk, to lower the pH add malic acid. Check the “specific gravity” (S.G) of the juice with a hydrometer for sugar levels. 15% sugar = S.G of 1070 and total potential alcohol content of around 8.5%, 10% sugar = S.G. of 1045 and total potential alcohol of 6%. This is if all of the sugar is fermented. If the S.G. is less than 1040 there may not be sufficient to protect the cider during storage and sugar can be added to raise the gravity. 2 ½ ounces of sugar should raise the gravity of 1 gallon of juice by about 5º. The juice now needs to be poured into a good quality fermenting vessel. 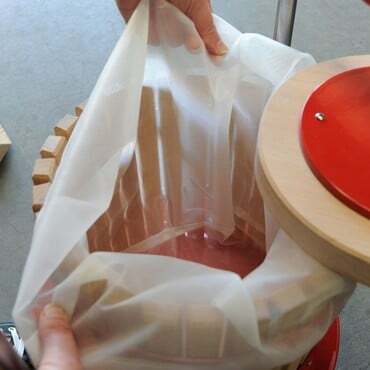 This can either be wood, stainless steel, glass or plastic (only food-grade plastics). Cover loosely as the initial fermentation can be very vigorous. Once it has calmed down, top up with more juice or water to exclude air and fit an airlock to the container. Traditionally nothing is added to the apple juice to turn it into cider, as the natural yeasts in the apples will turn the sugars into alcohol. A modern method of controlling the fermentation is by killing off natural yeasts with Sulphur Dioxide in the form of Sodium Metabisulphite (Campden Tablet), then adding a general purpose wine yeast. This has the advantage of subduing some wild yeasts and bacteria and reduces spoilage in the cider. Keep the fermenting cider at a steady temperature of around 15º. Fermentation can take anything from 10 days to 10 weeks. When the cider has finished fermenting, check the Specific Gravity with a hydrometer. If below 1005 it is time to rack the cider by siphoning into a clean container. Make certain that the sediment is not transferred. Ensure the new container is filled to the top, fit an airlock and put into a cool place to allow to clear. If more sediment shows, then you’ll need to repeat the racking process. 1 Campden tablet per gallon can be added after the last racking to prevent the cider spoiling. When you’re happy with your cider and ready to drink it, rack into bottles (all plastic fizzy drink bottles are suitable for cider) and keep in a cool place. If you’re using glass bottles, it may still be necessary to loosen the tops occasionally or the pressure could cause the bottle to explode.